Determination is not always a trait associated with dining, but occasionally it’s required. I’m resolute to get to Bad Saint before 2015 comes to a close, and it’s not the easiest goal to fulfill. 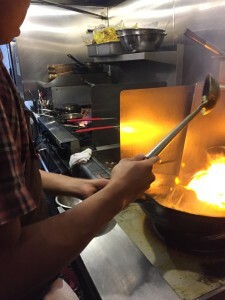 The tiny Filipino restaurant made its debut in Columbia Heights in September 2015. A preview pop-up attracts legions of diners, and the opening of the restaurant is eagerly anticipated. So, what does it take to eat at a 25-seat restaurant with rave reviews and no reservations? Two friends and I take no chances. We arrive at the Bad Saint doorstep at 4:30 pm on a Wednesday afternoon, and claim our stake as first in line. We perch on the stoop until the doors open at 5:30. Our reward for diligence is a seat at one of only two tables that can accommodate us. The line grows steadily throughout the hour, and many will have to wait their turn. Late arrivals are likely to be turned away. 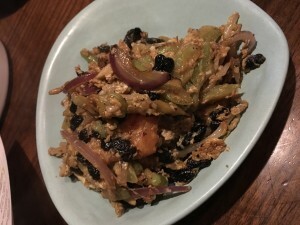 Filipino cuisine is a blend that takes its inspiration from Indian, Spanish, Chinese, and American cultures. 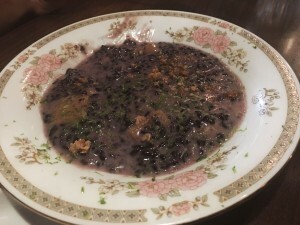 The dishes bear names that are difficult to pronounce and flavors that are often unfamiliar. It’s refreshing to delve into a cuisine that takes on sweet, sour, and salty in new ways. Owners Tom Cunanan, Nick Pimentel, and Genevieve Villamora have created a cozy spot that’s crowded but charming. 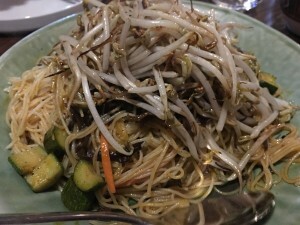 Thin rice noodles decorated with wood ear mushrooms, bean sprouts, and splashed with lemon oil – known here as Pancit Bihon Guisado- eases us into the meal. Pancit literally means noodles, and this is one of the few familiar dishes in a sea of the unknown. 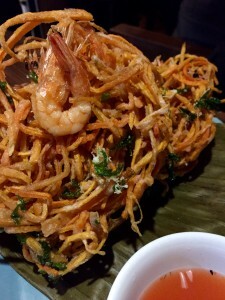 Ukoy is a delightful sticky maze of sweet potato fritters infused with shrimp and accented with cilantro. A vinegary sauce accompanies the dish, which I end up utilizing sporadically, to more fully savor the other flavors. Ukoy is addictive and filling. My advice is that if you are here with two people- which given the space is likely- leave some on the plate and save room for other delights. It’s not easy, but you will be rewarded. 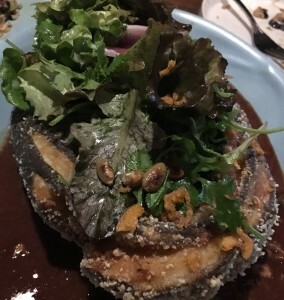 Piniritong Isda is whole fried branzino, blanketed with spicy greens. It’s a pleasure to dig in around the crisp edges and spoon up pieces of the meaty fish. 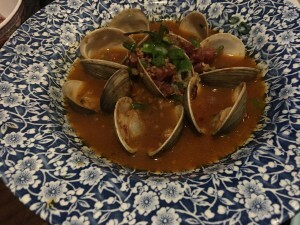 Finisang tulya is a dish that mingles littleneck clams with chinese sausage and sichuan chile. Here is where rice comes into play. It’s a necessity so you can soak up every drop of the intense sauce with its lingering depth of flavor. Every dish takes us by surprise with bold, rich flavors. The level of heat is assertive but not overwhelming. However our close proximity to the open kitchen precipitates an occasional delivery of smoke to our table, which some might find off-putting. We savor the view, and bask in the warmth of the staff. We conclude with the lone dessert on the menu, bilo bilo. Heirloom purple rice is sccented with lime zest, grilled apples, creamy coconut mile, and salted puffed rice for texture. It’s not the prettiest dish, but pretty isn’t everything. The grilled sweet apples balance beautifully with the rice, and it’s a very gratifying conclusion. Bad Saint is the kind of place I wish I could frequent. If only it was closer, larger, and accepted reservations. But I will happily adopt the same strategy for dining at Rose’s Luxury or Little Serow. I take the afternoon off of work and head downtown at 3:30 pm. Because that’s what you have to do sometimes to ensure that you meet your goals.